Dosas and Uthappams are very common in every South Indian household. Yet its always fascinating to have them in restaurants or in street food shop. Appa was working in Kollidam village and used to visit Mayavaram often as his head office is located there. He stayed there for some two years and during all his visits if he happens to be there in the evenings owuld never miss these Tomato Uthappams in a street shop. The street shop is owned by a brahmin and would serve only dosas and Uthappams. 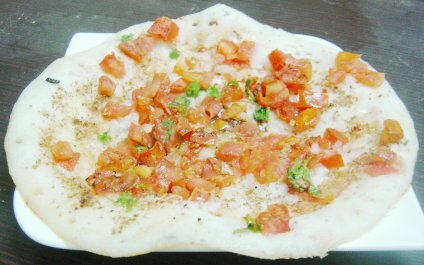 There is nothing new in the tomato uthappam served there except a special spice mix they used to flavor the otherwise bland tasting uthappams. Appa will be all praises of it whenever we serve uthappam at home as the tomato version is not common at home. After hearing that few times I asked him about how the spice mix tasted. With the clues he gave I finally able to reproduce it and when I served it with coconut chutney he was delighted. Toast them in a thick bottomed tawa till they start popping up and dry grind to a coarse powder. Mix it with 1/4 teaspoon of salt (or as per taste) and keep it aside. Heat a tawa and coat it with little oil. Pour a laddle full of batter and spread a little. The Uthappma should be 10-12 inches on diameter and 1/4 inch thick. Immediately sprinkle 1/2 teaspoon of the spice mix on it. 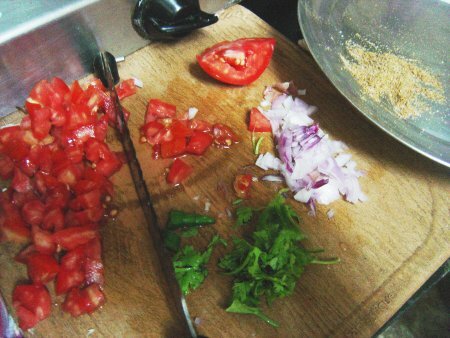 Spread 1/2 cup of chopped tomatoes evenly on the dosa surface. Again sprinkle 1/2 teaspoon of the spice mix. Sprinkle the chopped curry + coriander leaves and some chopped green chillies on it. Drizzle 1 tea spoon of peanut oil around and on the dosa and cover with a lid. Do everything in low flame so that the time u take to layer the dosa wil not affect the cooking time. Let it cook until the bottom side is golden brown and crisp. The top would get cooked by that time. If not cover it with a lid for half a minute as soon as u do the topping and then cook it further with the lid removed until the bottom side is crisp. Serve with your favorite coconut chutney. Sambar also is a good accompaniment. And this is my second entry for Srivalli’s Dosa Mela! Love this simple yummy recipe Nirmala. One of my all time fav. But never tried tomato in uthappam. Really very inviting. Nice Entry. Nirmala, lovely story about your father, and it was clever of you to reproduce the spice mix using only his description. As you point out, uthappam does tend to be bland, but your version seems to take care of that problem. Coriander, black pepper and cumin are a fabulous and flavorful combination indeed! nirmala they look yummy!!! I always mess up the tomato part…. 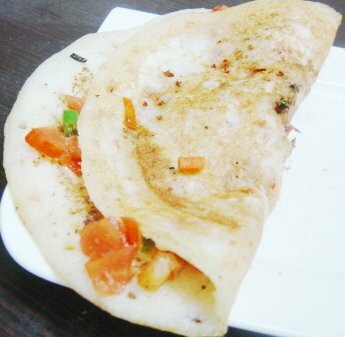 I will give ur recipe a try..
the dosa look delicious..love it….great entry!! !